The following programme for representative body for architects RIAI CPD on the role of Assigned Certifier was issued by email to members on 21st October 2014. 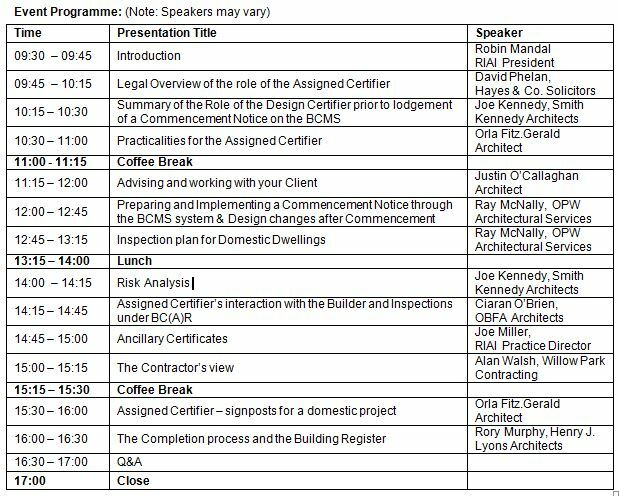 Many will recognise some of the speakers and topics from the highly popular RIAI CPD on the Design Certifier. As far as we are aware this is the first CPD on the role since implementation of SI.9 on March 1st 2014. The RIAI present a one-day seminar on the compliance process in the role of Assigned Certifier. PYRITE & THE ASSIGNED CERTIFIER? RIAI Assigned Certifier Survey – Results?